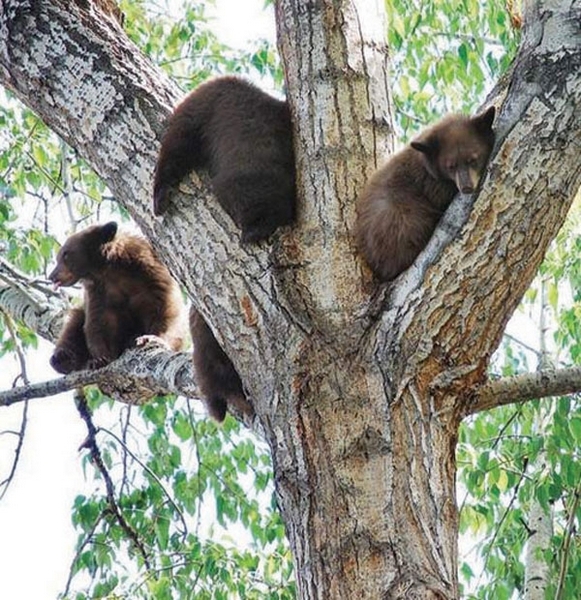 Aspen Times file photo/Janet Urquhart Bears, like this sow and three cubs in a downtown tree last summer, occupied a lot of the Aspen Police Department's time last year. Police recorded 1,040 bear calls in 2012. ASPEN – The Aspen Police Department’s annual crime and police-call statistics paint a picture of just how safe and small the town really is. The stats, which the department released Thursday, show that the biggest problem police faced in 2012 – from a sheer numbers perspective – was the plethora of bears in the city from early summer through mid-autumn. In 2008, police dealt with 82 calls regarding problem bears. The figure swelled to 351 calls in 2010 and 1,040 last year: a nearly 1,200 percent increase over the four-year period. Reasons for the big influx of bears last year have been well-documented. Because the spring drought caused a reduction in their natural mountain food supply, such as serviceberries and chokecherries, bears appeared everywhere. The downtown alleys were full of them between midnight and dawn, especially in areas behind restaurants that often failed to secure their garbage containers properly. During the daytime, bears often could be found atop crabapple and other fruit trees on Main Street, near the Rubey Park bus depot, in the pedestrian malls and around many city parks. Sometimes they attracted huge crowds of visitors and locals despite the police warnings. Often, authorities attempted to chase them out of the city limits, but the bruins would climb a tree or a building and play a waiting game with their pursuers. It was a big, furry headache for law enforcement. “The bears took up a huge amount of time and resources,” Aspen police chief Richard Pryor said. “At the same time, we felt we really had good cooperation from the community, and people did try to make a difference in their habits in terms of trash and using the right containers. The other number that leaps off the annual crime-stats page relates to alleged instances of fraud. In 2008, there were 55 reports to Aspen police in that category; 2010 saw 54 cases, but the number mushroomed to 175 in 2012 – a 218 percent increase over four years. Pryor said most of the fraud cases were reported in the spring in relation to the recording of credit-card numbers to make purchases. Police have no strong leads in the case and don’t know how the card numbers were obtained. In March, Sgt. Dan Davis, one of several local policemen fielding fraud-related calls, said it appeared that someone locally was obtaining the numbers, fabricating credit cards and distributing them to people outside the area. In fact, he was a victim: Someone used his credit-card account to make a $300 purchase in Mexico. Davis said it was possible that someone was hacking a computer system to steal credit- and debit-card numbers. Another scenario was that an employee of a particular local business obtained the numbers during the course of business. The purchases were typically small, less than $100, and targeted specific items in lieu of charges for cash. A few transactions topped the $1,000 mark, he said. In late December, though more allegations of fraud occurred after it was discovered that a skimmer device had been placed around the swiping mechanism of the ATM of a local bank to record debit-card and personal identification numbers. Pryor said most of those transactions occurred in the final week of December and the victims didn’t start reporting the thefts until early January, so the stats from that wave of fraud are likely to show up on the 2013 crime report. Overall, the report suggests that Aspen was a sleepy city in terms of crime. The total number of arrests dropped from 474 in 2008 to 398 last year, a 15 percent decrease. Drunken-driving arrests fell from 101 to 66, a 35 percent decline over the four years. Ski thefts were down, from 27 in 2008 to seven in 2012. Bicycle thefts were higher over the same time frame, from 74 to 89. Assault reports are significantly lower, from 98 in 2008 to 45 last year. Pryor said his officers might be categorizing more potential assaults as disorderly conducts than they did before. Domestic violence cases are up, from 68 in 2008 to 103 in 2012, but the police chief said he was unsure whether actual instances of the crime are higher or whether people are more likely to report it. He said his department has less turnover than it did when he took over its reins in late 2007, which may be a factor in the recent stability of community policing. The department counts 24 sworn police officers, five community-safety officers and one part-time wildlife-enforcement officer.